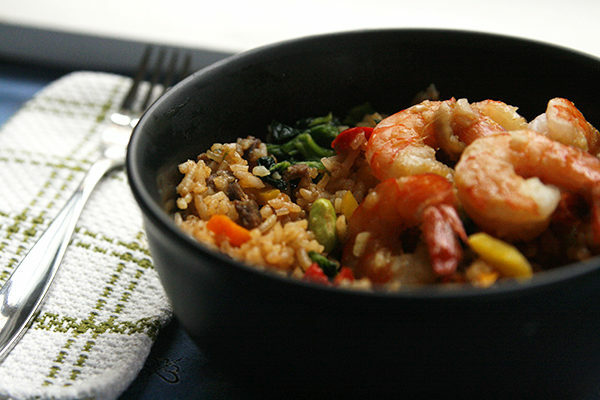 A sweet-savory garlic ginger glaze gives these broiled shrimp a delightful flavor that pairs nicely with the slightly spicy Ling Ling Bibimbap Beef Fried Rice. As a child, I didn’t play sports — not the organized team sports my friends played. It wasn’t that I didn’t have activities. While my closest friends were at T-ball or softball or field hockey, I was in the dance studio or on horseback or in the swimming pool. 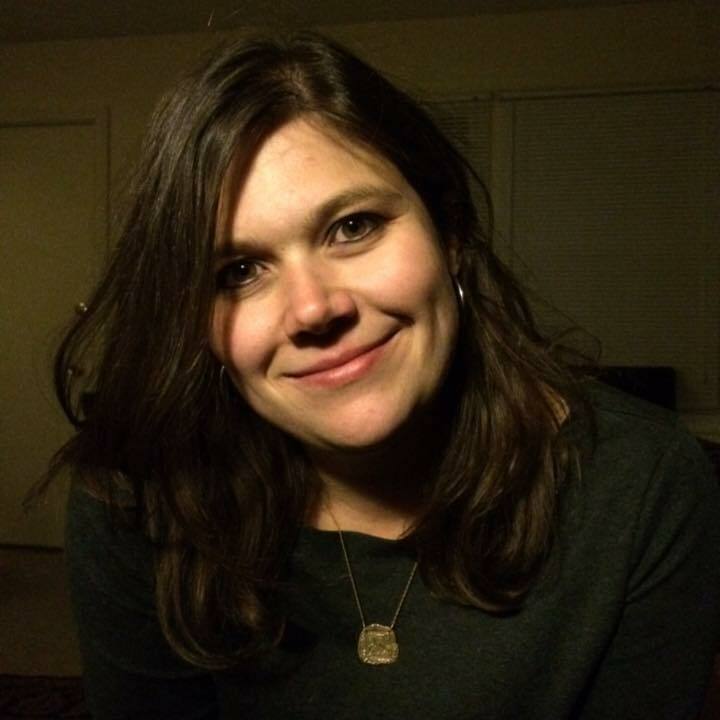 When my own kids came along, I never set out to be a “soccer mom.” In fact, even as I backed my SUV into a space at the soccer field week after week, setting out chairs and blankets and watching practices and games, I resented the title. Eight years and 14 seasons later, I love soccer — the sport, the teamwork, the game. Moreover, I love watching my kids play. That’s why I agreed to coach Paige’s team three seasons ago. Tonight was likely my final game as a coach, a bittersweet thing. The team I fielded this season was my best ever — not because of their skill but because they embraced the team mentality, coming together and recognizing each other’s strengths. Our 2-1 victory tonight was a result of that. I am so proud of them. Next summer, Will — who ran cross country this season — and Paige will both go to soccer camp. In the fall, they’ll both try out for the soccer teams at their middle school. And with any luck, they’ll both play for their school. If Paige doesn’t make the team (Will has already aged out of recreational soccer), then I will coach for one more season — happily. Whatever happens, I am so glad we all fell in love with soccer. That love resulted in four weeks of soccer camp for Will last summer — and while he didn’t make the middle school team, the experience was completely worth it to him. I was in the frozen foods section looking for something fast that my son and I could share for lunch. That’s when I spotted Ling Ling Bibimbap Beef Fried Rice. Bibimbap happens to be my very favorite Korean dish, so I bought it. 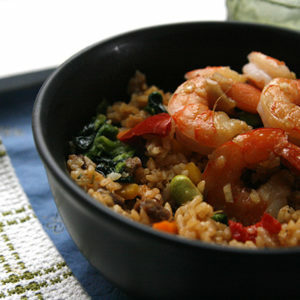 A little spicy, this rice dish is filled with tender, flavorful marinated beef, veggies and more. It’s delightful. 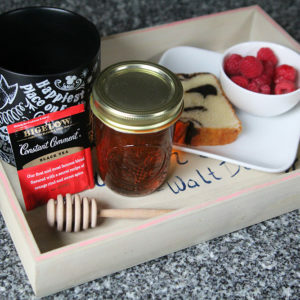 You can imagine my delight when I was asked to create something to pair with a Ling Ling Asian Entrée, as part of a three-part series on Sarah’s Cucina Bella. 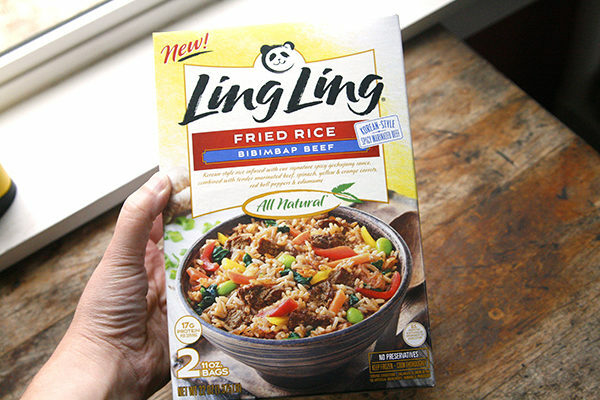 Having already tried Ling Ling products before and loved them, it was an easy yes. For this pairing I made Garlic Ginger Broiled Shrimp. Large, raw shrimp are brushed with a mixture of garlic, ginger, honey, soy sauce and olive oil and then broiled to perfection. 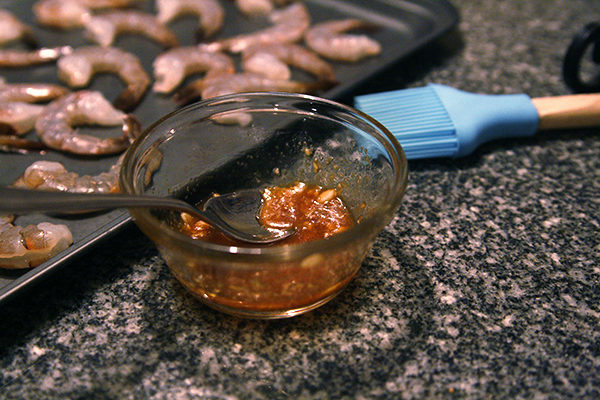 These tender shrimp caramelize slightly while cooking so quickly under the broiler. 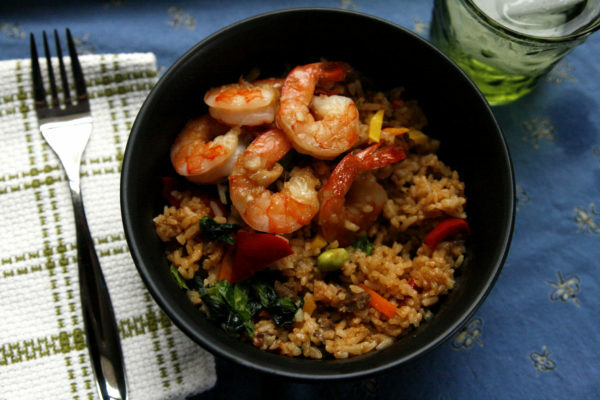 And it’s a lovely sweet, meaty contrast to the slightly spicy rice. 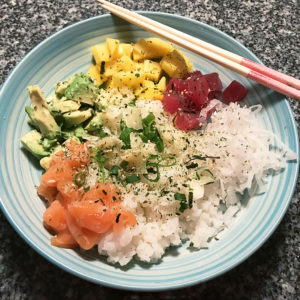 As for the rice, it’s so simple to make. 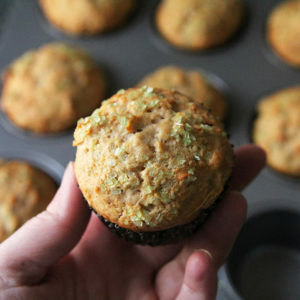 Just pop it in the microwave and cook for four minutes (there’s a stovetop option too). For four people, you should make both bags that come in the box. And perhaps serve a salad too. 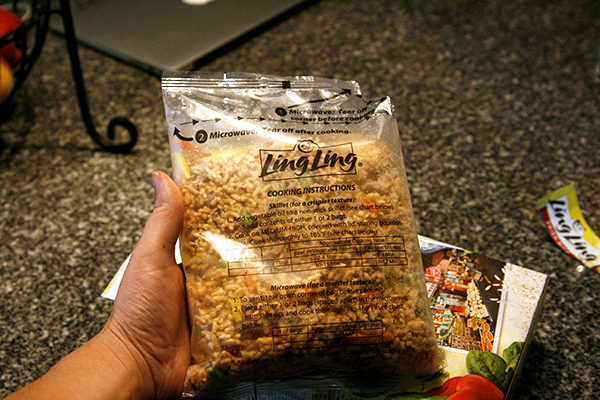 I need to tell you a little more about the new Ling Ling Fried Rice line though. 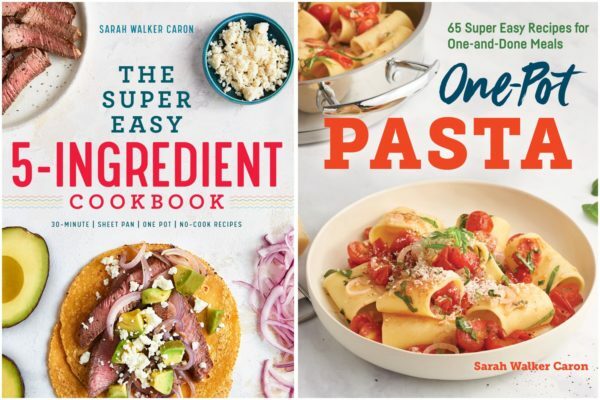 It includes five unique dishes that are Asian inspired recipes from Japan, China, Korea and Thailand. In addition to the one I used, there’s Yakitori Chicken, Yakiniku Beef, Thai-Style Chicken and Chinese-Style Vegetable. Ling Ling also makes noodle dishes and dumplings, based on Asian-inspired dishes from the region. For noodles, there’s Chicken Yakisoba and Drunken Noodles with Chicken and the dumpling varieties are Chicken Dumplings in Chili Sauce and Pork Dumplings in Chili Sauce. I can’t wait to try more varieties. 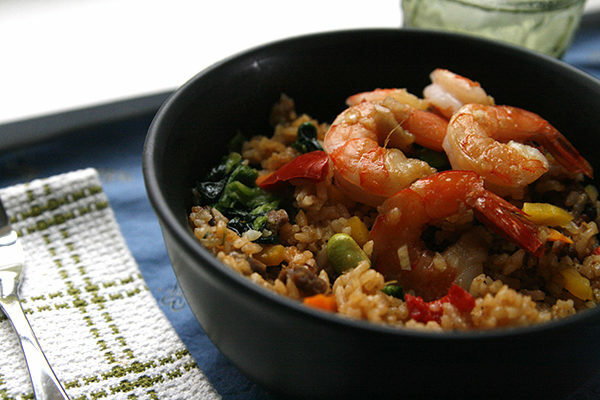 A sweet-savory garlic ginger glaze gives these broiled shrimp a delightful flavor that pairs nicely with the slightly spicy fried rice. 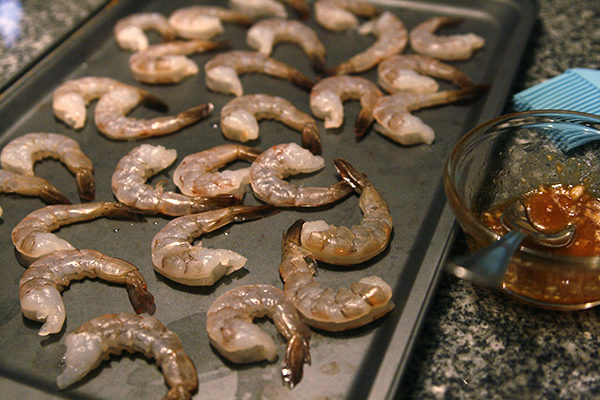 Arrange the shrimp on a nonstick baking sheet. In a small bowl, stir together the garlic, ginger, olive oil, honey and soy sauce. Brush on the shrimp. Cover and chill for 30 minutes before cooking. Set the broiler to high (or on, if you don't have a choice of settings). Uncover the baking sheet, and slide into the oven. The rack should be about 4 inches from the heat source. 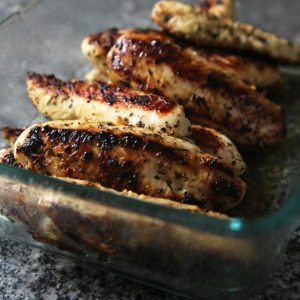 Broil for 2-3 minutes, until cooked through. Remove from the oven. Enjoy. We’re still in the “try everything” phase of sports. My gut just had his last soccer practice yesterday and he decided he wants to do tennis instead this round.